If you're looking for a midsize car that offers ample cabin space and standout style, the new Passat in Orlando is just what you need. Edmunds.com editor reviews say the 2016 Volkswagen Passat offers a quiet, comfortable ride; just two of many reasons why the Passat has become such a popular choice with Orlando shoppers. Continue reading our 2016 Volkswagen review below for more details about this sporty car. 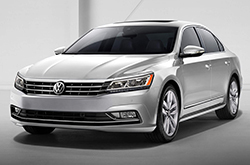 This year, the Passat in Orlando carries over many of the same exterior styling as before. Inside the new Passat gets an updated center stack and full leather seating on upper trim levels, as well as a review camera in all models (standard). Safety-wise, available options now include a lane departure warning system, a blind-spot monitor and frontal collision warning with automatic braking. Adding to the list of enhancements is the standard USB port that replaces VW's proprietary plug for smartphone and media player connectivity. Perhaps the most notable change for 2016, is the addition of the R-line model. This addition includes 18-inch alloy wheels, a leather-wrapped steering wheel and shift knob, as well as unique styling elements inside and out. Available with the Comfort package includes heated side mirrors, an eight-way power driver seat, heated front seats and leatherette upholstery; the R-Line trim takes the Passat to the next level. Step up to the SEL trim and you get all these features just covered, plus an eight-way power passenger seat, driver memory settings, leather upholstery, a premium Fender audio system and a separate ski pass-through for the 60/40 rear seat. For top-tier amenity, the SEL Premium trim is the way to go. With power-folding mirrors, front and rear parking sensors, remote ignition, an automated parallel parking feature, and a lane departure warning system; this model is sure to activate your senses. Aside from these fabulous features, the Passat will get you where you need to go fast. Whether you choose the turbocharged 1.8L four or 3.6L V6 engine, you're sure to fall in love with the power and fuel efficiency that both of these engines achieve. 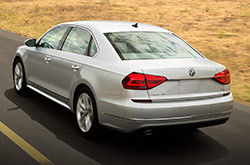 Expect top-notch safety features in all Passat models, as well. Those elements include antilock brakes, traction and stability control, a rearview camera, front side airbags and rear side curtain airbags. Building on that list you get a lane departure warning system, rear cross-traffic alert, a blind-spot monitor and a collision mitigation system in the higher-level trims. For more information, continue reading David Maus' 2016 Volkswagen Passat review below. When you're done, please visit us for a test drive today! Compare the 2016 Volkswagen Passat next to vehicles like the 2016 Toyota Camry, Nissan Altima and the Honda Accord, and we're sure you'll learn that the Passat trumps the competition in a variety areas. The Passat's leading-edge cabin amenities and bargain MSRP are just a few of the notable characteristics that shoppers will be smitten with. 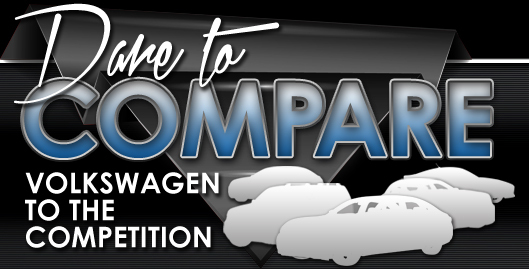 When comparing its price to the forementioned vehicle options you will clearly see that Orlando Volkswagen customers select it because it's a truly outstanding value. Check out our Quick List underneath this text for more info! Make the search for your next car quick and simple with David Maus Volkswagen South's reviews, like the 2016 Passat overview above, as well as other Volkswagen reviews in our gallery. Veteran automotive writers did many hours of research to write the reviews on our site. 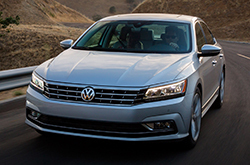 Everything you need to know about the Passat and other Volkswagen models is right on our site. Each article is overloaded with vehicle specs and invaluable facts pulled directly from Volkswagen and other sources you can rely on to give you up-to-date info. Learn all about our entire portfolio of highly-rated automobiles! If the Passat isn't the right model for you, we've got many other Volkswagen reviews and car comparisons. Visit our research directory to view them now!